Giao found the sausage to be a little "chewy", but the soup was flavorful and good for a cold night. It also reheats well for lunch. Sautee the onion, fennel and celery in a bit of olive oil until beginning to soften. Add the chicken broth and bring to a boil. Reduce to a simmer. Simmer, covered until the veggies are soft. Add the sausage ad serve. We were at a bar for a going away party for a co-worker of Giao's. As we left, we realized we were next door to the original Osha in the Tenderloin. We couldn't pass up a chance at their tasty noodles. This is a food that Giao reveres. It did not disappoint. This soup had just the right tart/sweet balance, but it was just a bit too creamy. It would have benefited from less coconut milk and more chicken stock. However, it was delicious and very filling. This fried rice is not very greasy, but very moist. The flavors are complex and tasty. We went to an art show at Fort Mason. The food was pretty much the same menu as last year, pretty good for a catered event, but not amazing. This is a terrible picture. The crab cake had a nice contrast of crispy to soft, but there was too much filler for our tastes. This was quite good. The fine duxelles was a nice match to the light, airy, crisp Phyllo. These were truly delicious little bites. Salty, sweet and tart all at once. The beef was a tad tough to chew. The strawberries and cheese were both fresh and good. Giao had a lunch with co-workers at Royal Exchange, a decent pub that's not so great on the food front. This was actually quite good. Lots of clams. This breakfast burrito has all of the food groups to get your day started. It is also a great way to use leftover veggies. La Tortilla Factory makes the only tasty low carb tortilla we can find, so use these, or just use a regular tortilla. Fry the bacon and place 2 slices in the middle of each tortilla. Scramble the eggs with the chopped leftover greens and place in equal parts on top of the bacon. 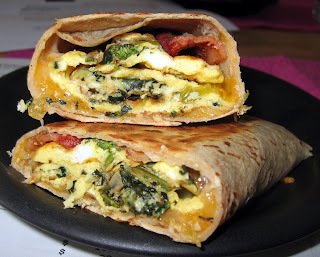 Sprinkle the cheese over the eggs , roll the tortillas into burritos and place (seam side down) in a hot pan. After a minute or so, flip the burrito over and fry on the other side for about a minute. The food was good, as usual, but the service was uncharacteristically slow. 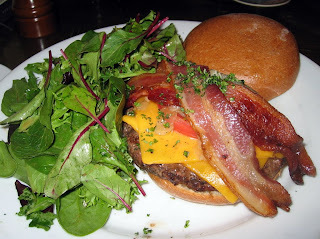 This burger is huge and heavy on the bacon. It's also nice to have the choice of salad or fries to offset the bacon. This was a simple, healthy meal. Alexis was excited to use the spigiarello greens that came in our CSA box. We had never heard of these heirloom Italian greens before. They are relatives of broccoli and are slightly sweet and slightly bitter and very good. Alexis sauteed these in olive oil with green garlic shoots and finished with a little lemon juice. 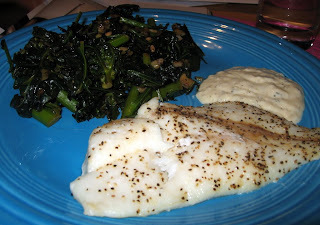 The fish was simply seasoned with salt and pepper and baked on 350 for about 10 minutes. The fish was garnished with a bit of tartar sauce. We had a poker game after work and ordered BBQ from Big Nate's for our pre-game sustenance. I'm not sure how much each dish was, but we ended up paying $13/person and there was plenty of food leftover. The brisket bites were the most tender and flavorful part of the spread. The chicken was decent. The ribs were actually a bit tough. It seems that people always judge BBQ on the sauce. For us, it's all about the meat, so this was just too saucy and not tender enough. 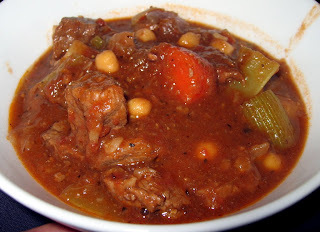 Stew is a great way to use up lots of random ingredients in the fridge. We also got a great deal on some stew meat. This stew will last about a week in the fridge. Brown the beef, then add all of the other ingredients. If the liquid does not cover the ingredients, add enough water just to cover. Stir well, bring to a boil, then reduce to a simmer, uncovered. Simmer for 2-3 hours, stirring occasionally. Serve alone, or with a side of roasted butternut squash. Instead of the standard orzo or Israeli cous cous we use quinoa because it has a chewy texture, similar to the pastas, but it contains more protein. Alexis makes this every time we have escarole in the house, so click here for the recipe. This soup reheats well for lunch for several days. We went to a friend's for some BBQing. Our meal was intensely meaty, accompanied by only grapes and sunflower seeds. Our friend, F., made these and they were succulent and well seasoned. This was our contribution to the party. We made about 10 lbs of short ribs, which we had marinated for about 24 hours. This was one of the most satisfying and most simple breakfasts we've had in a long time. Every time we are in the East Bay we have to stop at the Cheese Board. 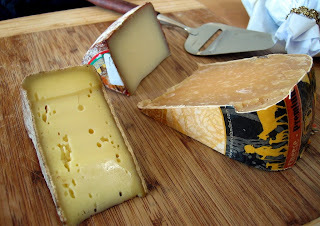 This time we picked up some Tomme de Savoie, an aged Goat Gouda and a hard, smooth, sheep's milk cheese. 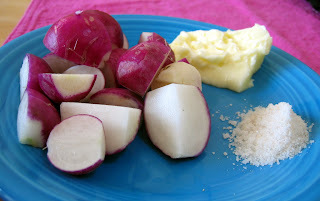 Organic Radishes with Peruvian salt and butter.